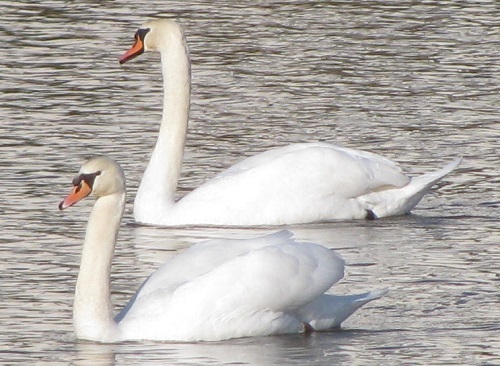 Yesterday, for the first time ever, I saw two swans swimming on my lake, so I’ll open with swans. I don’t exactly do New Year’s Resolutions. But I do like to make New Year’s Goals — measurable, definite plans. I like to make seven. Last year, I accomplished exactly half my goals. Exactly half because I’d split one into two parts and did one of the parts. And got three others done. For example, this year I’m borrowing an earlier year’s goal. One year a few years ago, I really did work on a book for a half-hour per day every day of the year. This year, I want to focus on that again. I’m going to modify it slightly and set a goal of working on a book three hours per week. I’m going to try to do it every week, but even if I miss a week or two, this sets my intention for what I want to do. I also like to choose a Theme for the year and a Verse for the year. This coming year will be my first tax year with no dependents other than myself (if all goes well). This brings up many issues about meaning and purpose. I wonder what God’s doing in my life and why He brought me down this path. Thinking about that verse gave me an idea to come up with seven 2016 Prayer Requests. Instead of me trying to do things, I’ll be asking God to do things! When I say 2016 Prayer Requests — I’m not necessarily asking God to complete these things in 2016. But I’m planning to pray these requests every day of 2016. These are the desires of my heart. I plan to present them with thanksgiving. And be comforted to know that God is working on them. Some of them are related to a goal. For example, one prayer request is that I get a book published. My part is to plan to work on a book for three hours per week every week this year. But I have no control over whether I get published or not. I’m going to ask God to work on that part! And making the request will keep me going on my part. After all, it doesn’t make sense to pray to get a book published and never write or submit one. Another example is related to my debt. I have way too much of it, and blame my divorce for most of that. But my divorce is long over, and I want to dig my way out. If I pray and ask God that I will get out of debt, it will help motivate me to meet the goals I’ve made to pay down that debt by a certain amount this year. Four of the requests are that sort of thing. You might call them selfish, but I’m thinking of it as knowing the desires of my heart and bringing them before the Lord. One request is that my two kids will find meaningful and well-paid work! I thought I’d make the final two requests more general, trying to keep me where I want to be: First, I’m going to ask God to continue to guide me this year and that I will follow His leading. Second, I’m going to ask God to help me touch lives. And the Theme and Verse this year? TRUST. I’m placing my requests before God, and now I want to trust Him. I like the idea, though, that I am looking forward to what God will do in the New Year. Today’s sermon resonated with me on several levels. Our pastor spoke about giving and generosity and money — a very timely topic, since I expect to lose my job in a few months and don’t know what I will do. I also have filed for divorce and don’t know how the settlement will turn out. So lots of reasons to worry about money, right? Pastor Ed spoke from I Timothy 6:6-19 to point out two big lies we believe about money, that hinder our generosity. Lie #1: We think our provision depends on what we do. If we depend on ourselves, we’re proud. Even when we worry because we think we haven’t done enough, we’re showing pride, thinking it’s all up to us. We shouldn’t be like antique collectors, but like a well-appointed distribution center, accepting gifts from God and passing them on to others. Lie #2: We believe that we would be happier if we had more resources. We put our hope in wealth. We think we aren’t doing so, but our actions say otherwise. And that’s foolishness. Wealth is so uncertain. Here he talked about putting our hope in our own plans. He talked about how God gave our church a wonderful piece of property, and we planned to pay for a building by selling two outparcels. But then the real estate market tanked. However much we were disappointed is however much we were putting our hope in our plans and not in God. And then we forget to thank Him for His abundant provision — the gift of the land in the first place. God’s will often is dynamic. He often doesn’t show us the whole picture right at the start. We need to walk with Him step by step. That part of the message resonated beautifully with what God’s been telling me about my divorce. As I said in my last post, I felt it was time to file for divorce. But I still worried if I was lacking in faith, not trusting God enough. Didn’t God tell me, and confirm and reconfirm, that He was making my husband a leader and a witness, and one day our marriage would be restored? I prayed about it. I thought this was the right step, but how could filing for divorce be following God’s leading? Was I just lacking in faith? Hebrews 11 says that Abraham reasoned that God could raise the dead. Abraham had to give up his own plan about how it should happen. As Pastor Ed emphasized today, my hope should be in God, not in my own plan. Surely God can resurrect my marriage, but if so it will be through His power, not because of any plans of mine, or any stubborn holding onto my marriage even though my husband has left. As for my job search, all the rest of the sermon related to that. I did not get the Assistant Branch Manager position I had applied for at my last posting. I now have four applications out there for four very different positions. I don’t know what my chances are for any of those positions. But as I think about the future, I will not be afraid. My last three jobs have been complete gifts from God. (No, pretty much every job I’ve ever had has been that.) It’s not like God’s going to abandon me now. I’m bolstered up by two Truths Pastor Ed pointed out from the Timothy passage. Truth #1: Our provision comes from God, and that’s where we should place our hope. Truth #2: God richly provides for our enjoyment. Don’t get so caught up in my own plans that I forget to enjoy and thank Him for the many gifts He’s already given! So, it was a beautifully encouraging morning. Instead of seeing my probable job loss as a tough trial I’m going through, the sermon reminded me to see it as a wonderful opportunity to see how God is going to provide. God did a beautiful thing for me today. Anyway, Saturday night I was choosing clothes to wear to church. I wanted to wear something pretty — I feel like God’s telling me He’s giving me beauty for ashes, and the truth is that He’s making me more beautiful during this trial, and I wanted to wear something to symbolize that. As I put the clothes aside, I thought how neat it would be if God had that verse come up in the sermon in the morning. I prayed and asked for it. I knew that would be symbol from God that He is indeed making me shine like a star in the universe, by His grace. Well, the verse did not come up in the sermon. It was a good sermon, about living your Christianity in your job. I got to thinking, well, it was a silly little whim. God certainly didn’t have to do that. What are the chances that that particular verse would come up anyway? Now there was no doubt — “shine like stars in the universe” is exactly quoting the verse. By this time, my eyes were streaming with tears! By doing that little thing for me, I felt that God was telling me He loves me. He cares about the little things of my life. He cares about my emotional pain. And He is indeed making me shine like a star. Do everything without complaining or arguing, so that you may become blameless and pure, children of God without fault in a crooked and depraved generation, in which you shine like stars in the universe as you hold out the word of life. . . I had asked God if I should defend myself and answer the letter that hurt me? Well, in His loving and wonderful way (with His sense of humor), He gently led me to the answer: “Do everything without. . . arguing”! And, in fact, my answer is my life, in which God is making me shine like a star. Pastor Ed preached yesterday about the state of our church. Some obstacles and discouragements are coming up, but he also talked about why he still believes God is and will be doing a mighty work at Gateway. One thing he came back to is that many years ago, God gave him a vision about this church, a vision about lives changed through God’s power. He acknowledged that for some time now, our circumstances aren’t seeming to fit with that vision. That got me thinking about long-term vision. I, too, feel that God has spoken to me about something in the future. I believe God has told me He is making my husband “a witness to the peoples, a leader and commander of the peoples.” I believe that God has told me that our marriage will be healed and restored. But for now, circumstances don’t match. It looks like a divorce will happen soon. I thought about long-term visions in the Bible. We talk about the verse Psalm 119:105 — “Your word is a lamp to my feet and a light to my path.” Invariably, commentary on that verse mentions that walking by lantern light does not give you the long view, just the next step. And in the Bible, we humans don’t do too well with long-term visions. Look at the Israelites heading for the Promised Land. When the spies looked at the land, they looked at the circumstances — giants who were way too tough for them. Only Joshua and Caleb remembered God’s promise and God’s vision. Look at Abraham. God told him that he would make his descendants like the stars of the sky. Then nothing happened for years and years. Abraham thought he’d better help God out with Hagar. Then there’s Joseph. God gave him a vision of his brothers bowing down to him. Joseph didn’t give up on the vision that we know about. But who knows what he went through waiting for it to happen while he was in prison? I recently heard a testimony about a restored marriage from a woman with my same name and her husband. They were divorced for ten years before the husband came back to God and came back to his wife. That’s a long, long time. Along the way, God continued to speak to her and tell her not to give up, even when her husband married someone else. Long-term vision is hard for us humans. Sometimes God gives us the big picture. Then the challenge is trusting that God can bring it about even when the little picture, from our perspective, doesn’t look like it can possibly fit into that big picture. I liked what Pastor Ed said about the at least two and a half years we will have to wait before we can get into a new church building. He said: This is our opportunity to be ready. By the same token, however long I have to wait for the restoration of my marriage, this is my opportunity: My opportunity to get rid of resentment, to practice forgiveness, to work on my own relationship with God, and even to work on personal pursuits like my writing. Part of the challenge of a long-term vision is asking yourself: What does God want me to do today to get ready for that vision to happen? Sometimes, like with Abraham, it’s simply to wait. Sometimes, as with Joshua and Caleb, it’s to go in and take the land. But where God has provided the long-term vision, surely He will also provide a light for our feet, if we ask. But be careful about looking at circumstances, like giants in the land or a barren womb, to conclude that God never really meant what He said in the original vision. Sometimes the hardest thing to do is simply to wait. You are currently browsing the archives for the Guidance category.